It is already a long-standing trend, that people oftentimes give preference to distant and online education rather than personal visits to university or courses. This raised a matter of the ways of distant control over the students’ knowledge and progress, and thus gave a boost to computerization of data in the sphere of education and learning. Though, there are some free test generating websites and extensions on the Internet, such as ClassMarker or LearnDash, they rarely fully correspond to the specific needs of businesses. Online test generator software as long as website design for online classes are in great demand today, and our company had experience developing such a system. Not long ago one of our clients requested a test generator for their website. The website specializes on content generation and the owner needed a handy tool to effectively check the expertise and skills of potential copywriters. Mobilunity created an easy test maker OTest, which allowed both to create sets of tests and take tests on the user side. Such a test generator can be implemented in two ways – either as a helpful widget for taking tests, or as a whole website module for testing and examination. Angular 2 appeared to be the major framework to facilitate OTest frontend development. With the upgraded syntax of TypeScript, Angular 2 much aided the execution of the test generator frontend. Another helpful tool, that we used for frontend as well as backend development, is ReactiveX library. Interactivity and responsiveness of OTest was achieved by using one of the most popular and convenient HTML, CSS and JS framework Bootstrap. Backend development of OTest system was performed mainly with the help of Node.js toolkit. ActionHero.js API server helped to deliver the application with the ability to respond on-the-spot to the users actions and react accordingly. Since all the testing and user data is stored on Mongo database, the team chose Mongoose library to build logical system and model application data of OTest. 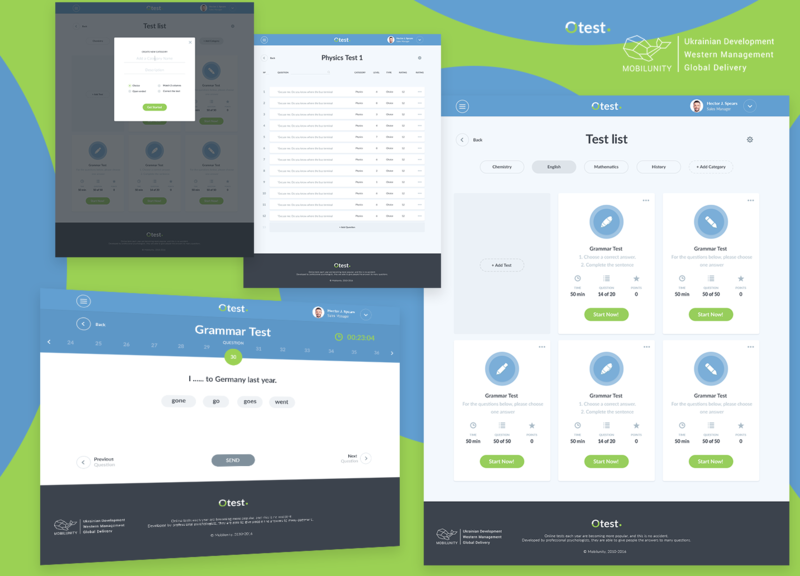 The UI design of this online test generator software was created to be not too intricate, but intuitive and simple clear, so that it doesn’t disturb the testing process and only assists in finding the necessary categories and tests. Test generation software similar to OTest can be used for lots of purposes including test creation, сourses & university examination, certification, interview & personnel testing, capacity building process. Mobilunity team offers completion of handy test system development in no time! Read more about our enterprise software development and healthcare software developer in our blog. Gain great testing widgets and test generating modules developed by Mobilunity! Integrate API SMS Service into Your WordPress Website!